A dynamic UI theme for Atom that (kinda) follows Google's Material Design Guidelines. Best with Atom Material Syntax. Inspired by Mattia Astorino's SublimeText theme. Atom Material UI supports different accent colors. To change it, go to Settings > Themes and click the cog icon next to the theme selector. Please check the CONTRIBUTING.md file. You can download the redesigned icon from dropbox. It's a ZIP file containing multiple resolution PNGs, ICNS and ICO formats. Windows ICO converted by Akshit Tripathi. 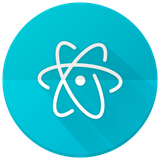 Atom Material UI is licensed under MIT.